Menopause is a time of hormonal imbalance, known mostly for the common hot flashes and mood swings, but since these chemical messengers are heavily involved in regulating your body's immune system, it can also be a time when mild allergies begin striking you more severely or when previously unknown allergies appear. 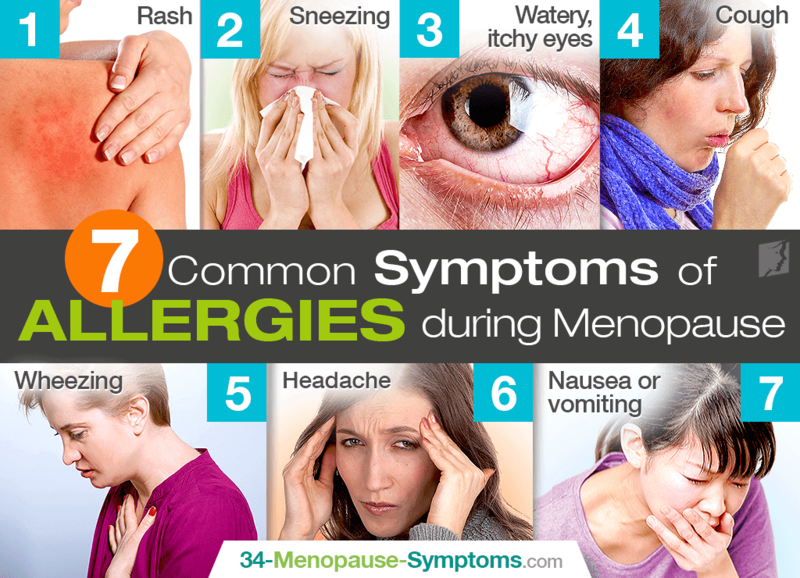 Continue reading to discover some of the most common menopause allergy symptoms so that you can be better informed to decide how to glide through these transitional years with increased ease. Allergies can cause your skin to flush and a mild, pink rash to develop. Rashes can also come in the form of eczema, contact dermatitis, and hives. Verify with your doctor that your reaction was not caused by a food allergy. Sneezing is not always a sign of allergies, but an increased frequency of random episodes that are not accompanied by symptoms of a cold and last more than two weeks is likely to be due to allergies. Sneezing goes hand in hand with itchy, watery eyes. This can be one of the most frustrating and annoying symptoms of allergies, feeling as if there is something in your eyes when there isn't anything at all. Watery, itchy eyes can also cause redness, irritation, and a clear, watery discharge. A dry, persistent cough may be an underlying symptom of allergies during menopause. If triggered by the hormonal fluctuations taking place in your body, you might notice that you cough more in some seasons or some environments that have presence of allergens. Wheezing is caused by swelling or narrowing of your throat or airways to your lungs. The symptom can also lead to shortness of breath due to the lungs not being able to hold as much air. While it is a common symptom of exposure to allergic triggers, wheezing can also be from exercise or further illness. Allergy headaches can be either sinus headaches, with pain over the sinus area that causes facial discomfort, or migraine headaches, which are throbbing, one-sided headaches often made worse by light and accompanied by nausea. Triggers include nasal or sinus congestion, smoke, foods, and more. While it is true that histamine intolerance can develop during menopause, the same is true of food intolerances and sensitivities, triggering digestive problems in women passing through their mid-years. Accordingly, nausea and vomiting are two of the most common food allergy symptoms during menopause. In conclusion, times of hormonal change, such as menopause, bring a heightened risk of developing allergies or worsening any previous ones. Common symptoms of respiratory allergies include a rash; sneezing; watery, itchy eyes; cough; wheezing; and headaches, and they rarely cause serious problems. On the other hand, food allergies can cause nausea and vomiting and may be more troublesome. For allergies worsened by hormones, the best way to deal with the symptom is by pursuing allergy treatments that resolve the root cause of hormonal imbalance. When allergies surface, have peace of mind in knowing that you'll be best equipped to deal with them.